Previous image, 53 total items. Next image, 53 total items. 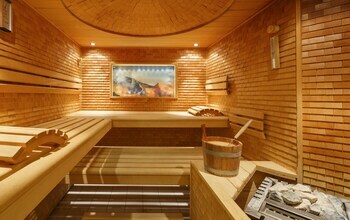 Visit a European country known for its alpine scenery, vast freshwater lakes, picturesque cities, chocolate and cheeses. Experience the cultures and traditions of different language communities. Switzerland is a small European country of great natural beauty, where big cities are close to mountains, lakes, forests, rivers and plenty of fresh air. Ski down alpine slopes, cruise inland lakes and venture underground to learn about the origin of the universe. With so much impressive scenery, Switzerland doesn’t lack for outdoor adventure. 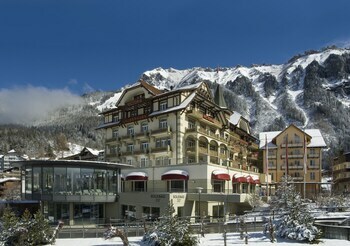 Head off to the mountain resorts of Verbier, St. Moritz and Interlaken for skiing and snowboarding. 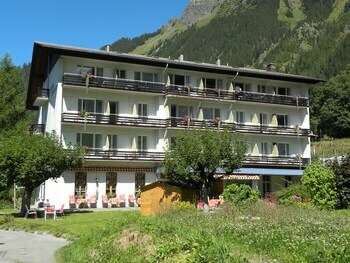 Go hiking through the mountainous Swiss National Park. Experienced climbers can tackle the Matterhorn, the colossal pyramid-shaped peak in the Swiss Alps. The Swiss love to explore their own country and SwitzerlandMobility is a national network of hiking, cycling, mountain biking and canoe routes covsering approximately 12,500 miles (20,117 kilometers). Routes are marked by signposts and color coded according to the pursuit. The trails are connected to Switzerland’s dense public transportation system, making them easily accessible from wherever you are in the country. There are also more than 80 Rent a Bike stations, where pedal and electric bikes can be rented. For an alternative way to enjoy the scenery, climb onboard the Glacier Express. The train ride travels through the mountains, valleys and deep gorges between Zermatt and Davos or St. Moritz. Book a cruise across a Swiss lake, such as Lake Geneva or Lake Zurich. At Lake Lucerne, enjoy a sunset cruise on a paddle steamer. Devote some of your vacation time to discovering Swiss cities. Shop in the medieval arcades of Bern, the country’s capital. Follow the history of the Olympic movement at the Olympic Museum in Lausanne. See the twin-towered Grossmünster cathedral in Zurich, the country's largest city. In Geneva, find the huge Jet d'Eau water fountain and CERN, the particle physics laboratory. Tour the underground facility to discover how international teams of scientists are trying to unlock the mysteries of the universe. Switzerland is also known for its chocolate and cheeses. Visit cheese factories in Gruyères, home to the eponymous cheese. Go on a guided tour of Maison Cailler, the Swiss chocolate factory in Broc. In November, join locals in Bern as they pay homage to a more humble food source at the Onion Market (Zibelemärit). During this folk festival, try traditional savoury treats such as tarts and soups as well as Glühwein, a delicious mulled wine. Switzerland has a host of other festivals celebrating everything from hot air balloons to yodelling, so time your visit to experience the cultural diversity of this beautiful country. Overlooking Lake Geneva, the breathtaking snow-capped Alps provide the backdrop for medieval history, culture, luxury shopping and Swiss chocolate. Visit the upscale ski resorts, trek across the snow-capped mountains and learn about the mixtures of cultures in this eclectic region. Explore the remarkable historic center, ornate with churches, museums and antique buildings, in this Swiss town just north of the Bernese Alps. Visit this medieval defense structure overlooking Lago Maggiore to browse its archaeological museum and learn about the history of the Visconti from Milan. A dream for lovers of nature and outdoor activity, this scenic part of Switzerland is packed with Alpine peaks, valleys, rivers, lush pastures and lakes. 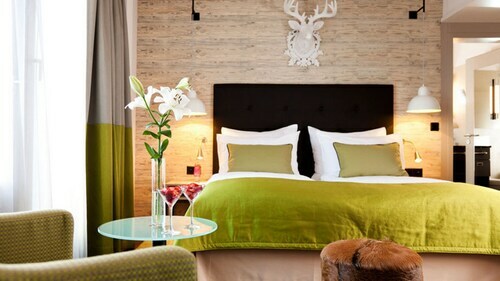 Situated near the airport, this luxury hotel is 0.9 mi (1.4 km) from Circus Salto Natale and within 6 mi (10 km) of Hallenstadion and University of Zurich. Zurich Exhibition Centre and Halle 622 are also within 6 mi (10 km). Zurich Airport Tram Stop is 8 minutes by foot and Zurich Airport Freight Tram Stop is 8 minutes. 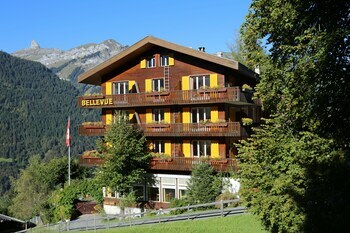 Situated in Ennetbuergen, this luxury hotel is 1 mi (1.7 km) from Hammetschwand Lift and within 9 mi (15 km) of Stanserhorn Cable Car and Klewenalp Cable Car. Dallenwil - Wiesenberg Cable Car and Dallenwil – Niederrickenbach Cable Car are also within 9 mi (15 km). 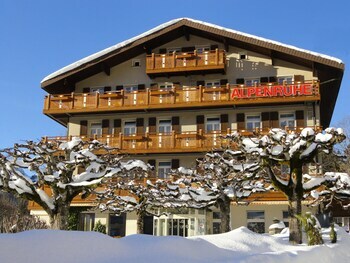 Situated near the airport, this eco-friendly hotel is 0.8 mi (1.4 km) from Kart-Bahn Zurich Ruemlang and 2.8 mi (4.5 km) from Circus Salto Natale. Hallenstadion and Halle 622 are also within 6 mi (10 km). 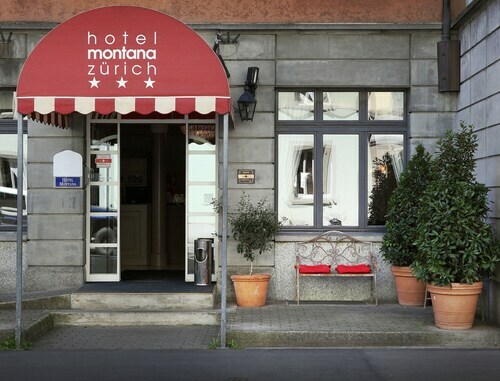 This family-run hotel dates back to 1958 and is located in the center of Zurich in a quiet part of city, near a shopping district and the Swiss National Museum, 400 meters from Zurich main station and the Old Town. 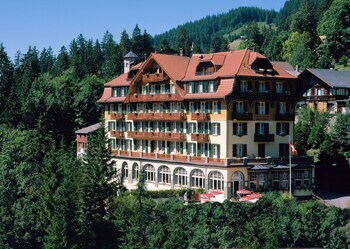 This Lucerne hotel is 1 block from both Lake Lucerne and Rosengarten Collection. Chapel Bridge is 2 blocks away. The Lucerne train station is a 5-minute walk from the hotel. 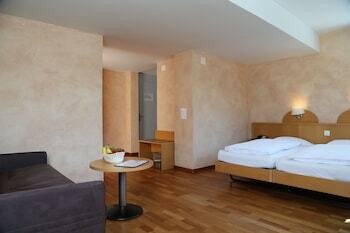 Situated near the airport, this hotel is within 1 mi (2 km) of Geneva Arena and Palexpo. United Nations European Headquarters and CERN are also within 3 mi (5 km). 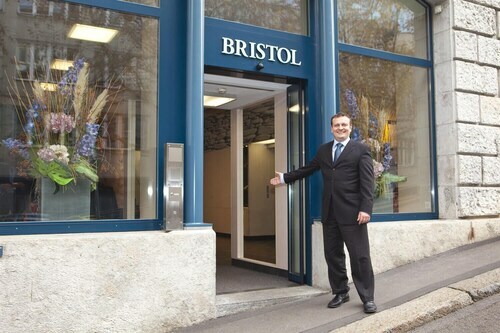 Blandonnet Tram Stop is 14 minutes by foot and Geneva Airport Station is 13 minutes. 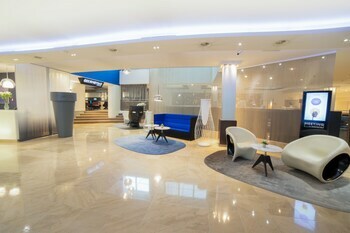 This family-friendly Zürich hotel is located near the airport, within a 15-minute walk of Swiss National Museum, Bahnhofstrasse, and Zurich Town Hall. ETH Zurich and Kunsthaus Zurich are also within 1 mi (2 km). Zurich Center S-Bahn and Bahnhofplatz-HB Station are within a 2-minute walk. 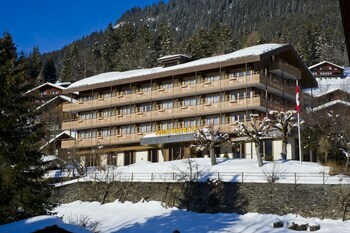 Located in Gewerbeschule, this hotel is within a 10-minute walk of Museum of Design and Swiss National Museum. Bahnhofstrasse and ETH Zurich are also within 1 mi (2 km). Museum fuer Gestaltung Tram Stop and Sihlquai-HB Tram Stop are within a 5-minute walk. Mon., 3 Jun. - Fri., 7 Jun. Sun., 9 Jun. - Sun., 16 Jun. Vancouver Intl. - Cointrin Intl. Sat., 8 Feb. - Sat., 15 Feb. Thu., 3 Oct. - Fri., 4 Oct.
Wed., 12 Jun. - Fri., 14 Jun.